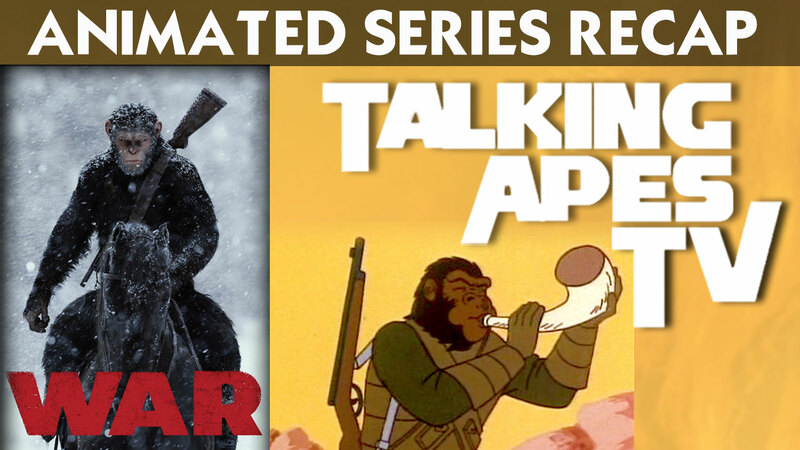 TALKING APES TV: Return to the Planet of the Apes Series Wrap-Up and WAR Review! Hey Hey Ape fans! Welcome to the Return to the Planet of the Apes series wrap-up debriefing show. Join Richard and Mark as they give their favorite and least favorite episodes, guilty pleasures and most controversial moments between Mark and Richard as they argue over ice mountains, pigs, vampires and puddle sizes! This episode also covers recent speculations over the Gary Dubin/Felix Silla debate and how Battle for the Planet of the Apes plays into all this. We also review the short story, ‘The Unknown Ape’ – by Andrew EC Gaska, from Planet of the Apes: Tales from the Forbidden Zone. WIthout giving anything away, this story features characters from both the Apes TV series and the films! Great story that answers lots of timeline questions. We couldn’t leave off without our thoughts about War For The Planet Of The Apes, the third film in the new Apes theatrical films. Judging by the box office number lots of Ape fans have seen the film. Just in case you hadn’t, we keep it as spoiler-free as possible. With that, Talking Apes TV will be going on hiatus. We covered everything we could when it came to Apes on TV. But we will be back as we’re sure there are more classic Ape stories to cover. And we will be leaving our Facebook page up to stay in touch. We want to thank all you Apes fans for listening and sharing your feedback with each episode. We also want to thank Angela Rushmere for taking care of our Facebook page, Rob Dehlinger for composing our theme song as well as the specialized jingles used in the show and Sarah Woloski for creating the artwork and posting the shows for you to hear. Now Go Ape and remember Ape Fans Together Strong!